How long does an upgrade take? What determines a tech's permissions? Check out this video (6:00) on automating ticket creation. 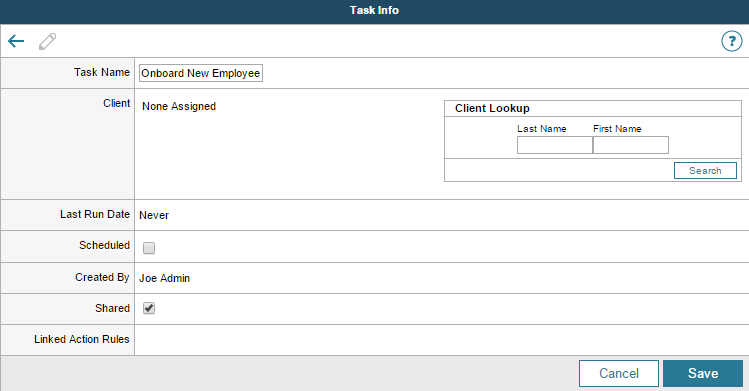 You can use Web Help Desk tasks to automate ticket workflows. When the action rule runs the task, the task elements become tickets configured with a request type and associated tech. In the toolbar, click Setup. Sharing a task makes it available to other techs and for use in action rules. A task must be shared before you can configure an action rule to run it. Click Task Elements, and click New. Configure the child ticket to inherit field values from the parent ticket. Select the Inherit Value check box for one or more fields. Select a Request Type, enter a Subject and Request Detail, and click Save. Add your remaining task elements, and click Done.